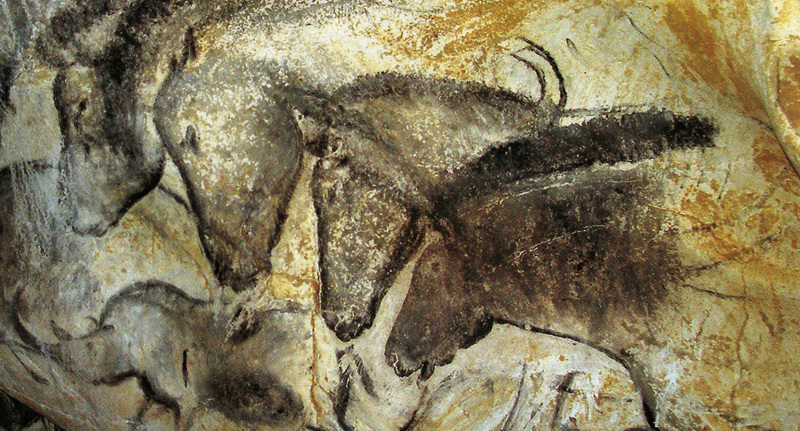 The oldest dated painted cave, also one of the most skillfully done, is Chauvet at 32,000 BCE. It was the exception that broke entirely the perception of a long history of progression of style, resulting in the most spectacular caves being done 12,000 to 20,000 years ago. Most of the painted caves are in a region near southern France and northern Spain. There are today approximately 300 caves identified with Paleolithic art on the walls (Bahn-Fagan 596). The Ice Age climate in the area of the caves was much colder than today, possibly by as much as 10 degrees celsius. In the winter "heavy snow falls would have made human movement difficult, but during the summers an absence of dense forests had the opposite effect: people could travel freely." Vast glaciers to the north locked up so much water that land bridges to the British Isles existed, and the coastlines of the mainland were much farther out. The tundra and open plains were inhabited by "herds of bison, wild horse, aurochs and reindeer, as well as mammoth and woolly rhinoceros, creatures whose thick coats were strikingly adapted to the cold" (Lewis-Williams 74). These herds migrated regular routes and it is assumed hunters followed them.